So, I think it’s safe to say that the macrame trend has officially become a classic craft… yet again. It honestly does not show any sign of disappearing, and I am all for it. Personally, I adore mini macrame projects, like this DIY macrame pendant I made for eHow. It’s great when you get that itch to play with string. Or is that just me? Yeah? Alright, then. 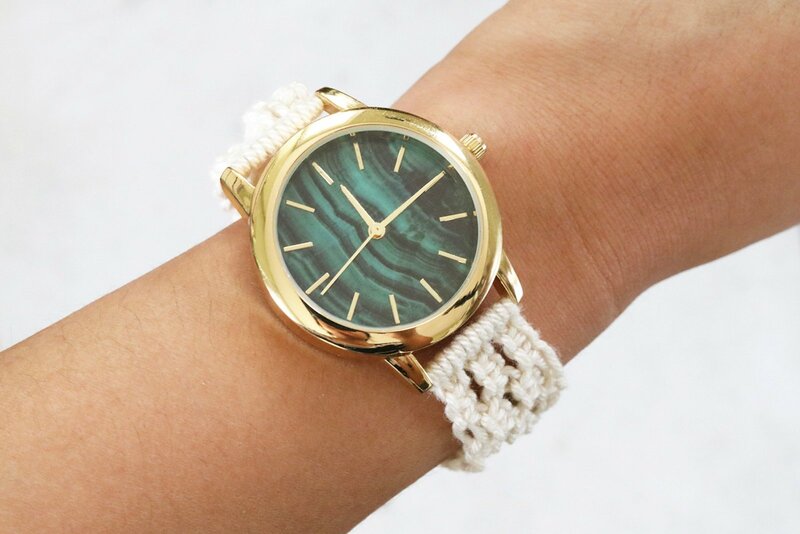 Recently, I gave it another go with a macrame watch strap tutorial at eHow. This is perfect for replacing dingy old watch straps that have had their run. However, if you want to start from scratch, you can also buy an inexpensive watch and remove the straps. I snagged this beautiful marbled watch face from Michaels for just 7 bucks. Love love love it. To make it yourself, visit the DIY at eHow. Happy knotting!